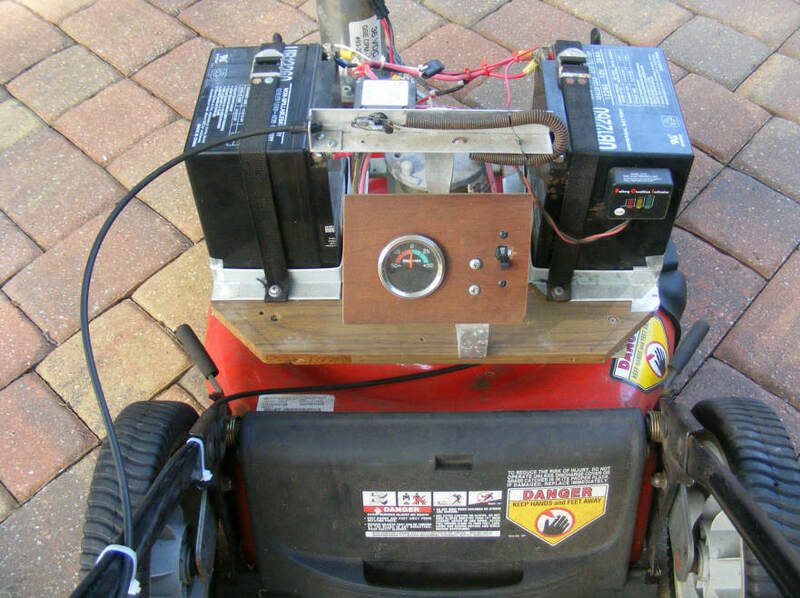 This is Lee's latest solar-electric mower project -- he describes adding a simple but very effective electric self-propulsion system to solar charged electric mower that was converted from a Troy-Bilt gas mower. This is a nice and straight forward design that gets the job done without adding a lot of complexity. The Troy-Bilt mower I converted about 3 years ago is still running strong – as a matter of fact, its Tecumseh motor is running cooler and drawing fewer amps than it did the first year. In addition to mowing the lawn, I also use it for mowing weeds and brush on the Florida jungle portion of my property, and for mulching all manner of organic matter for my compost piles. This has turned out to be a very reliable mower, and very powerful (it will shred 1” limbs and branches) - and it has the additional virtue of having practically no maintenance requirements. 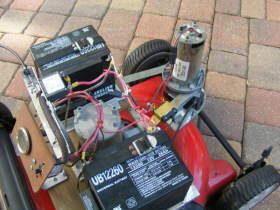 The one problem it did have, however, was that one of the two original 22 Ah AGM batteries went bad in the first year, so I replaced both of them with 26Ah batteries. With the larger/heavier batteries, I noticed a big improvement in mowing time, but at the expense of my back and legs. The mower may be running better than ever, but my tired old body hasn’t gotten any younger or stronger over the course of the last 3 years. So, I started thinking about making it self-propelled. I didn’t get anywhere with that for over a year, but then two things happened recently that got me going again: (1) an old friend gave me beat-up Troy-Bilt self-propelled ICE (Internal Combustion Engine) mower with virtually no usable parts except the front-wheel drive mechanism and (2) a new friend responded to my Craigslist ad (“Non-working cordless electric lawnmowers wanted”) and said he had a 17” cordless POJ (Piece Of Junk) he’d give me if I drove to his place in St Augustine and picked it up. 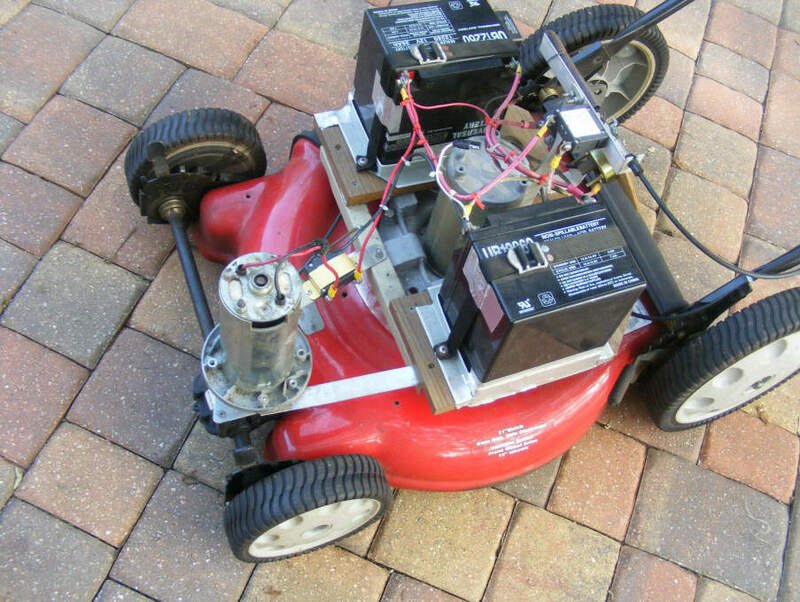 The cordless mower turned out to be an old Toro, with a small, lightweight 1 HP 36v motor. 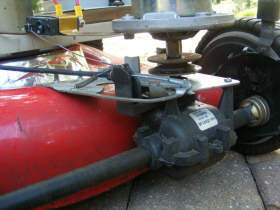 I started playing around with the Toro motor and the Troy-Bilt self-propelled front-end and discovered that the gods of serendipity were smiling down on me: after I got rid of all the non-essential elements of the front-wheel drive mechanism, I discovered a shaft with male threads that EXACTLY matched the female threads in the shaft of the Toro motor. Plus, the rotation of the motor was the same direction as the handedness of the threads. And finally, I discovered that running the 36v motor at 24v resulted in a speed over ground that was a perfect walking speed – 12v was too slow and 36v was too fast. I only regret not buying a bunch of lottery tickets that day. Anyway, I replaced the two front wheels on my cordless electric Troy-Bilt with the front-wheel drive mechanism from the gas-engine Troy-Bilt mower, and then wired the Toro motor into the existing 24v circuitry of my mower. The first mowing/driving test was extremely satisfying – no slowing down at all when mowing high, wet grass - and I could detect no difference in either motor’s speed when one or both of them were running. 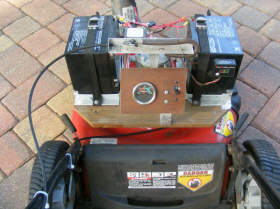 I’ve used my “new” cordless-electric self-propelled mower for a few weeks now and while the available mowing time has been cut by about a fourth (from about 60 to 45 minutes), the blade rotational speed seems not to have been affected at all – this is probably due in large part to the 26 Ah batteries which have an inherently larger reserve capacity than the 17 Ah batteries found in most commercial cordless mowers. Also, I can mow my entire yard in one 30-minute session now, just guiding the mower around, whereas it used to take me two or three sessions (totaling about 50 minutes) because I would get so tired pushing the mower. Wiring Diagram -- click on for full size. 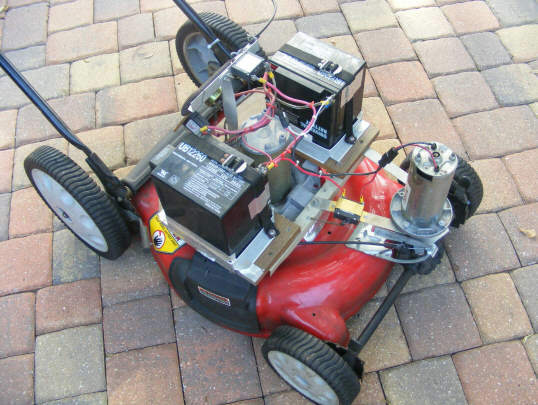 I still have a few minor bugs to work out, and some fine-tuning to do, but I wanted to let fellow tinkerers know that there is at least one way, besides spending $400+ for a commercial one, to get a self-propelled cordless-electric lawnmower. 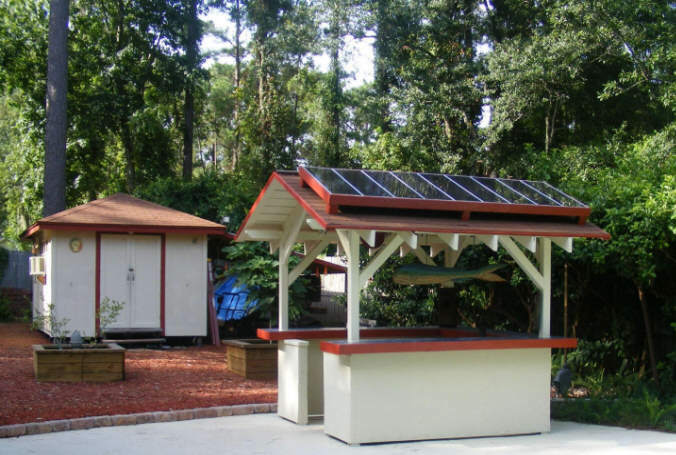 PS – I’ve once again expanded and moved my solar array – it now consists of nine 15 watt panels positioned atop my new smokehouse, giving it maximum solar exposure anytime of the year, sunrise to sunset. The array is connected to the same Xantrex C40 Solar Charge Controller I purchased 3 years ago which rapidly charges the mower, and also charges two 12v 105 Ah batteries which, via a 2000 watt inverter, powers my entire workshop (except the AC) and nighttime security lighting.